Deliver intense nutrition to hair with the limited edition Essence Absolue Protective Oil from Shu Uemura Art of Hair’s collaboration with Japanese artist Takashi Murakami. 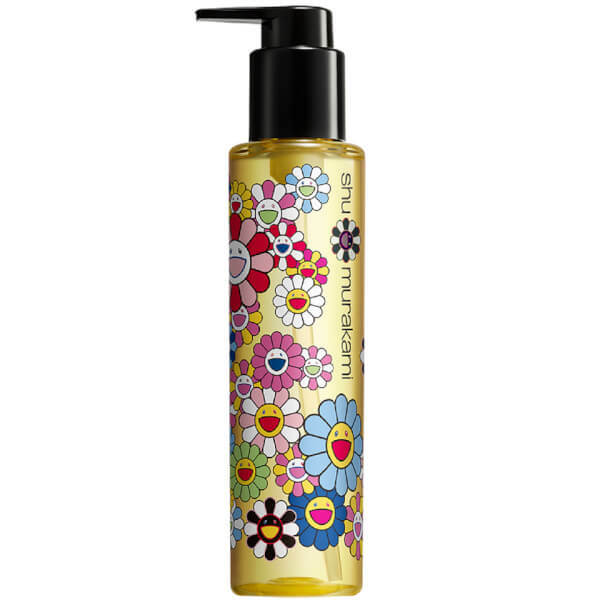 The bestselling hair oil arrives in a decorative pump bottle, emblazoned with Murakami’s iconic flower design. Boasting multiple uses, the essence functions as a hair oil that moisturises and protects the hair, whilst delivering intense nutrition. The formula can be used as a styling aid, pre shampoo treatment or a luxurious conditioning treatment. Fortified with Camellia oil, the fast absorbing oil works into the fiber, leaving locks soft, silky and ultra-shiny. The lightweight oil is perfect for daily use and is able to deliver UV protection all day long. Apply 1 to 2 pumps from root through the lengths on dry, colour-treated, damaged or normal hair. Use before shampooing or as a leave-in. Cyclopentasiloxane, Dimethiconol, Camellia Kissi/Camellia Kissi Seed Oil, Ethylhexyl Methoxycinnamate, Butylphenyl Methylpropional, Hexyl Cinnamal, Hydroxycitronellal, Parfum/Fragrance F.I.L C29120/1.